The RCV215A is a heavy duty cutter designed for deployment in severe working conditions including nuclear storage ponds. 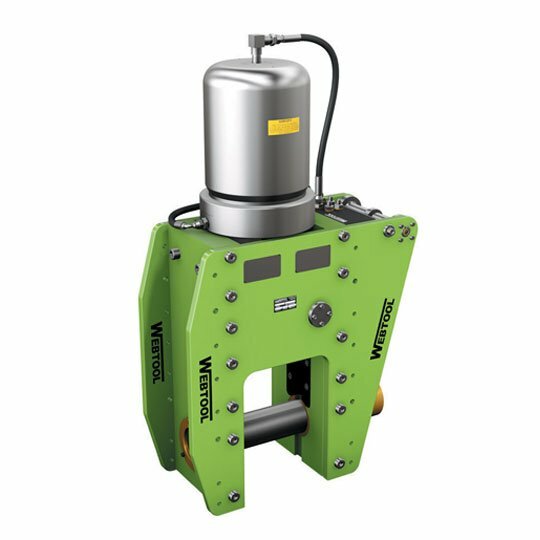 The integrated hydraulic anvil allows easy location on the work piece, removes the need for user intervention and makes the tool easily deployed and operated. Designed to cut structural steel sections, tubes and wire ropes. Fully marinised for use both subsea and in storage ponds. Corrosion resistant, lightweight and durable aluminium and stainless steel construction. Genuine Webtool™ blades and anvils give optimum cutting performance and ensure that maintenance is kept to a minimum. Hydraulically operated anvil makes capturing and severing of the work piece simple. Mounting holes in the body allow for the fitting of standard multi-position lift frame or bespoke mounting brackets. Supplied with integrated manifold kit. Serviceability and Support – Spare parts including blades, anvils and seals kits are available. Contact us for technical questions and support. Standard multi-position lifting frame is available. Contact us for details. Capable of cutting steel sections including channel, I-beams, RHS and tube/pipe. Contact us with your specific requirements.